Most people think of immediate-type allergies when they think of food allergies. You eat a peanut, get hives and your lips swell within 30 min. This kind of “real” food allergy can be life-threatening. Read here what to do if you have an immediate-type food allergy. The delayed-type of food allergies, also called food sensitivities, can be hidden amd are more insidious. They cause chronic inflammation. Delayed type food allergies are more common than you think. In fact, a majority of people experience food sensitivities or intolerances and simply aren’t aware of it. In fact, one of the most common symptoms of an un-diagnosed food allergy or sensitivity is fatigue. However, most people are not aware of this. 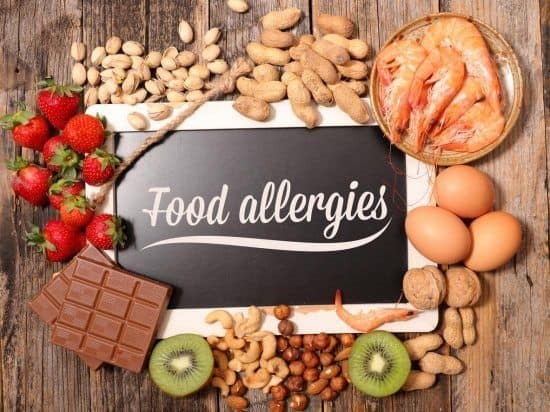 Individuals can be sensitive to a wide variety of different foods, but an overwhelming majority of these “allergies” are in response to a small number of foods. So what are some common causes of delayed-type food allergies? What are some symptoms that you may have an un-diagnosed food allergy or sensitivity? People can be allergic to a wide variety of things. However, there are a few foods that are more common causes of delayed-type food allergies. Around 90% of immediate food allergies concern 8 specific allergens. They are: peanuts, milk, eggs, wheat, nuts, soy, shellfish, and fish. The best-known delayed-type food allergies (or food sensitivities) are gluten (wheat), dairy and eggs (especially egg white). What is another extremely common allergen. The symptoms presented in the case of a gluten sensitivity will vary based on the severity of the condition: it can be something mild with symptoms such as fatigue or bloating, or more serious like depression or IBS or even an autoimmune condition. It can be pretty difficult to avoid wheat, especially in a western diet. Milk allergies and sensitivities are fairly common. Thankfully cow’s milk is relatively easy to avoid. It is easy nowadays to get almonod milk or coconut milk if you deal with a dairy allergy or sensitivity. Eggs are a common cause of allergies and sensitivities as well, especially the egg whites. It is pretty hard to avoid eggs in your diet, but it is possible. HERE is a resource on possible egg substitutes when baking or cooking. These aren’t the only symptoms, but they certainly are the most common. Chronic fatigue is one of the major symptoms of a food allergy, but it is often misdiaognosed. So make sure not to overlook the possibility that these symptoms could be caused by a food allergy. In short, food allergies and sensitivities are extremely common. Even more common is the possibility that you may have an un-diagnosed food allergy. If you are experiencing chronic fatigue, depressed mood, headaches, or joint pains the cause could be a delayed type food allergy. Have you experienced chronic fatigue? Then I encourage you to visit my website. My mission is to change people’s lives for the better by mentoring and guiding people back to physical, mental, financial and spiritual health. I am a board-certified dermatologist, naturopath, allergist, nutritionist, and a certified high performance health coach. As a Certified Integrative Nutrition Health Coach, I know how to guide people to the right decisions to re-build their health from the ground up. DocChristine is trained in root-cause medicine and can figure out the reasons as well as give you directions and support to help or heal your fatigue, depression or other chronic illness. Make your FREE appointment today!